It’s always an emergency situation when you have a sick or injured chicken. 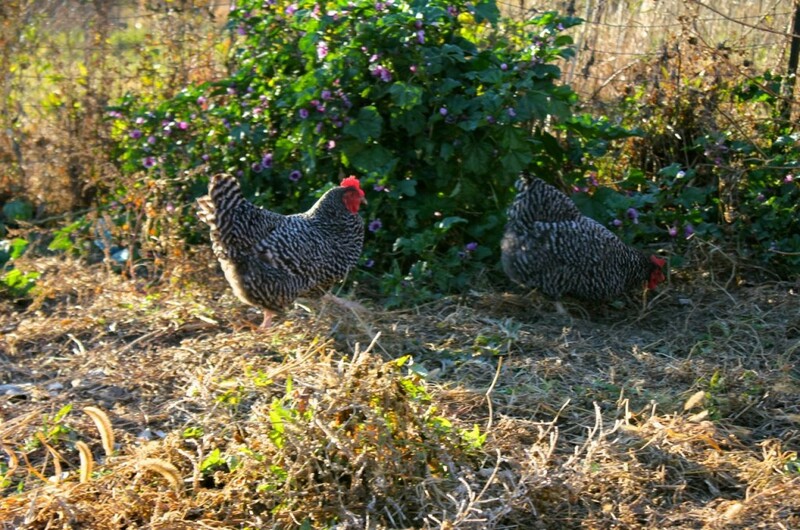 Emergencies happen in and about the chicken yard, and you usually don’t have the luxury of much time to respond properly to them. You definitely don’t want to be in your car driving around madly looking for supplies while your poor chicken is at home suffering. 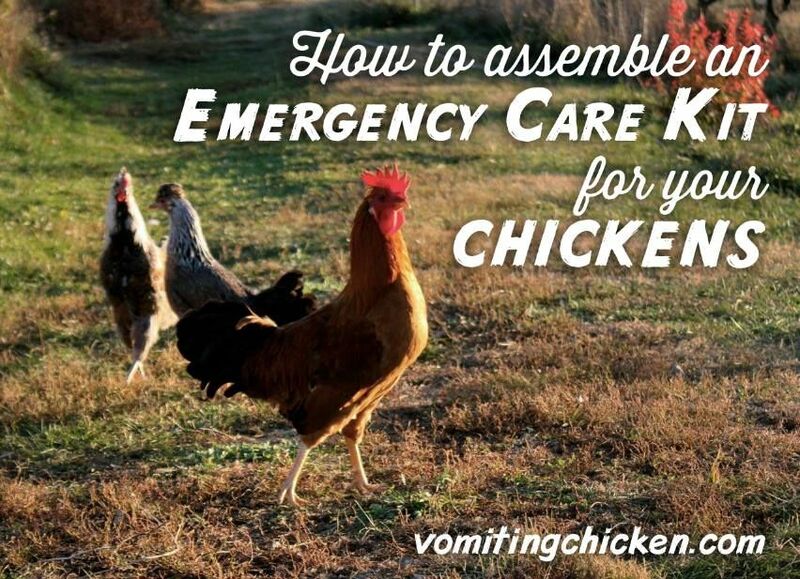 If you keep chickens, you really need to keep a well-stocked Emergency Care Kit, just for your chooks. Having the right supplies at hand when you need them can actually save a chicken’s life in some situations. It doesn’t take much time or effort or money to achieve the peace of mind that you are prepared to meet whatever emergency you may be faced with, chicken-wise. It took me a few years to take my own advice, and assemble the kit that I have now. Meanwhile, I’ve made it through several full-blown chicken emergencies which would have been much easier to deal with had I had the fully-stocked sick chicken kit. To wit: Bea, our Aussie-who-herds-everything-that-moves, was anxiously trying to usher one of my favorite hens, Little Red, into the chicken coop. It was sundown, after all, and all the rest of the chickens were in their places in the coop, as they should have been. It is maddening to Bea, to have a chook that won’t heed her. Little Red, however, had developed an endearing habit of climbing the vine on the house, and roosting there at nights. She was stubbornly avoiding going into the coop. Bea didn’t care about this, she just wanted the silly chicken to do what she said. Immediately. Ollie, our black lab, meanwhile ambled up and agreed to help Bea with this Most Important Mission. Little Red started squawking, both dogs got excited, and by the time I was able to pull them off of the little hen, she had lost the skin from most of one side. Poor thing! I didn’t know what to do with her, except to separate her from the other chickens, and provide her some special treats and fresh water. 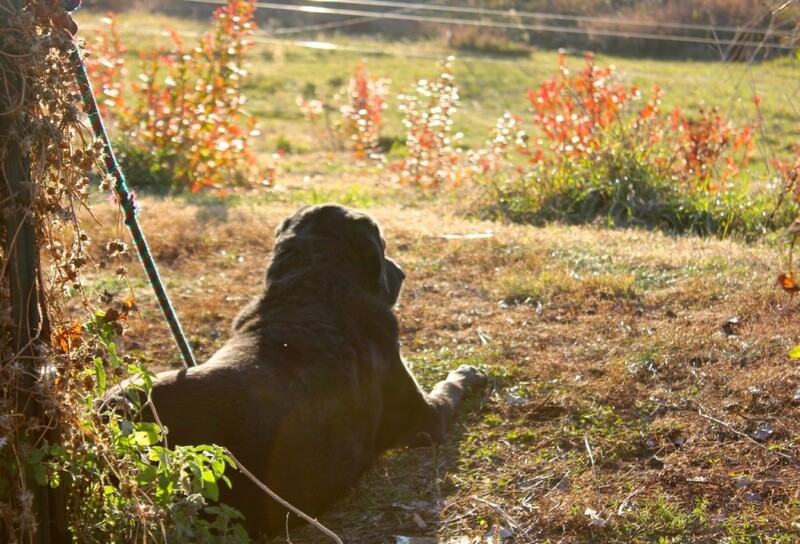 Ollie is usually a patient hound and waits for me, watching the chickens, while I do some garden-cleaning chores. Unbelievably, she healed up over time, but I could have eased her suffering a great deal that first night, had I had some of these emergency supplies at hand. OKAY, squeamish folks, you can join back in now. Bless your hearts. Let’s not cry over spilled milk, or hurt chickens now, let’s just do what we can to care for our flock better, if there’s a next time (which I hope there’s not!). This stuff can mean the difference between life or death for a wounded chicken. Vetrimycin: There are lots of choices in this particular product, which is great for spraying on cuts, abrasions, bruises, or any wound. This particular product is the veterinarian formula, and three times as strong as the hydrogel formula. If your chicken gets hurt and has a wound of any sort, this spray can be a lifesaver! You can borrow some out of your Kit when you need it for a sliver or a good foot-soaking session, too! Epsom salts: a good all-around soaking agent, if you have to do any minor surgery, like that of Bumblefoot, on a chicken’s foot, or any other soaking or surgery needs. This can be a lifesaver to a weak or puny chick! Vitamin powder: When I’ve got new chicks brooding in my garage, I keep this vitamin powder on hand to add to their water. It helps the chicks get through the first few delicate days, when oftentimes a chick will fail to thrive and die, for no apparent reason. It’s also a great all-purpose powdered supplement for all your flock during times of stress–extreme heat or cold, for example. Non-stick Bandages: When you need to bandage up a wounded chicken, these non-stick pads are very handy to have on hand. They can be trimmed to the size you need. Waterproof tape works great to hold the non-stick bandages on wounds, and can be used for your people emergency care kit, too, of course. 🙂 Duct tape is also a good thing to have on hand, in case of foot wounds. This lower-cost coconut oil works great! ACV: This item is not exactly for emergency care, but I keep it on hand for my chooks’ well-being, just the same. Of course it’s in my ‘fridge for people care, too. 🙂 ACV helps to prevent worms, reduces slime buildup in waterers, and has many healthy benefits to your chickens. Usually the unfiltered kind with the ‘mother’ still in it is best, all-around. Store-bought, filtered ACV will have no ill effects on your birds, but may not have as many benefits as the unfiltered kind. I put in between 1 and 3 tablespoons per gallon of water. Word to the wise: NEVER, EVER, EVER use ACV in galvanized waterers! The acidity causes corrosion of the metal, which can lead to zinc poisoning in your birds. Got that? Never. And isn’t it a sweet thing to see a chicken smile? For obvious reasons . . . 😉 If you are working with a hen with a prolapse, or any sort of emergency surgery, or any poopy or bloody issues, it does give a measure of peace of mind to have some gloves on. And these are cheap, in quantity. You can toss them when you’re finished with them. Squeamish folks, do I hear an Amen? All-purpose bandaging tape: stretches and doesn’t stick. You can use it for people-wrapping, too, in a pinch. Super Glue: is great for repairing beaks and also for emergency cut repair. Shoot, I use it for emergency people cut repair too, to be honest! A good pair of clippers: can be used to trim a raggedy beak, spurs, or o’er-long toenails. Pick-No-More: One thing about chickens: they will pick at anything different . . . if one chicken looks strange to the rest, or if one chicken is hurt, the other chickens (potentially) will peck at it. This lotion keeps the other chickens from pecking. Word to the wise: this stuff will dye your hands purple and they will stink for days if you don’t wear gloves. The nice thing is, the chickens seem to hate the smell just as much as you do–which, of course, is the point. You can use this to keep the roosters from pulling the hens’ head feathers out. It will also discourage the hens in the top of the pecking order from plucking the other gals bald. 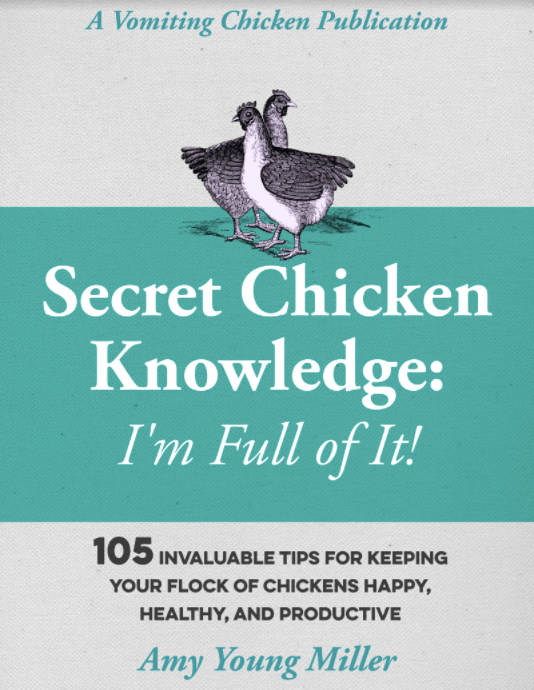 If you have this product on hand, you’ll have to isolate a hen for picking far less often. It’s great! Antibiotic Ointment: offers pain relief and antibacterial properties. Important Note: it’s crucial not to use just any antibiotic ointment with pain killer on your chooks. 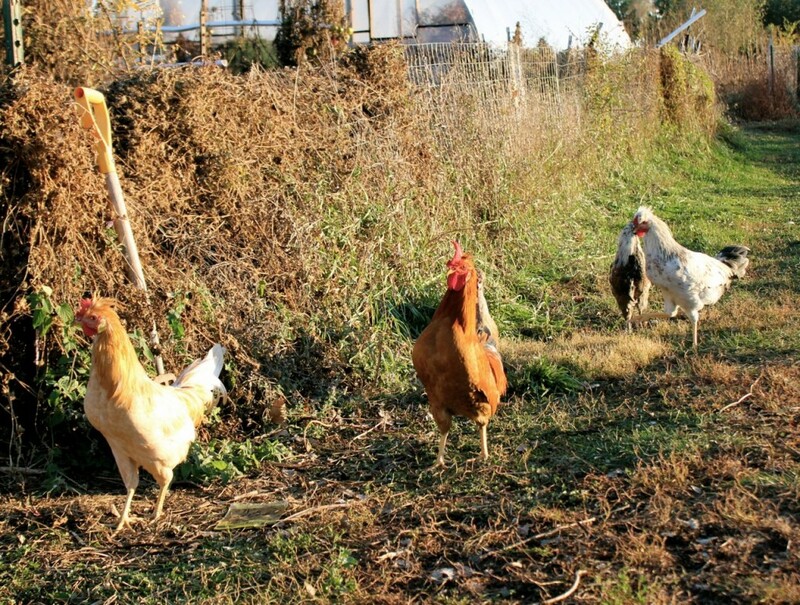 Any ointment with “caine” or “cane” in the name can be harmful or fatal to chickens! Neosporin has a mild pain relieving properties, and of course is antibiotic, so is good to use on wounds or cuts. If you have to perform any kind of surgery, it is important to clean the area on your chook first. Using rubbing alcohol is an effective way to clean and disinfect the skin, but should not be used near the bird’s eyes. Important: Rubbing alcohol can also be used to disinfect minor cuts and scrapes, but should not be used for deep wounds. needle and thread (fishing line) in case you need to put in stitches: just be sure to sterlize the thread first! This stuff is awesome, though a bit expensive. Manuka Wound Honey: is great to have on hand for people-emergencies and studies show that it really does help the healing process. It has documented anti-bacterial powers. This honey used to treat wounds is a medical-grade honey and is specially sterilized and prepared as a dressing. Yes, it’s real honey, from New Zealand. Keeping a kit of these items on hand will give you peace of mind any time a chicken-related emergency comes up. And you can’t put a price tag on peace of mind, can you? So enjoy those chooks, but be prepared to care for them in an emergency situation, too. Before it comes up! It’s November and being grateful is trendy. I practice gratitude every day, and today I’m counting my many, many blessings, of which you all are at the top of the list! p.s. If you click on any of these links and buy your stuff through them, they won’t cost you a penny more but you’ll be supporting a worthy cause–this blog! Thank you so much! ← Embracing Whimsy: Miniature Plastic Deer Kits and a Giveaway! I have most of this on hand for people too! One of my birds is getting bumble foot and has been getting a daily soak in warm Epsom salt water with a few drops of teatree oil and organo oil. I use those for the anti bacterial, viral and fungal properties. Seems to be healing up fine! Well I want to thank you for that bit of information. I have been talking to my wife about our rooster and hen and am about to add a couple more chickens, but because they live on the farm with a much larger flock, I believe I will leave well enough alone, continue to get my free range eggs, and chickens when needed and allow my brother-in-law the fun of raising the chickens. 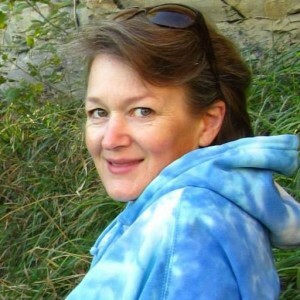 My wife works hard enough getting me to go for medical attention when needed, It would just add to the problems if we had to add a nursery for ill and hurt chickens to our list of daily animal care. My grandfather raised hundreds of chickens as an income stream after retirement. In those days, if one hen had a soar, he put a kind of black pitch or tar on it to keep other chicks from picking at it, other than that I never witnessed him do much more. Now it sounds like raising chickens is a lot bigger deal that I knew. The nice thing is, Chef, you don’t generally have to use these supplies very often. But when there is chicken emergency, it’s great to have them at hand.